Okay, so I know the rest of you who are avidly following Hank Green's (well, it's not only his, but) webseries, THE LIZZIE BENNETT DIARIES are seeing that shiny hundredth episode drawing nigh, and doing a lot of sighing. But, what else are the Bros Verde doing these days? Dispensing knowledge. More knowledge. To Knowledge junkies. Together with my fave magazine mental_floss, John Green is talking smarts. This week Mr. Rogers, who is always a happy topic, and who would have been eighty five this month. Tor.com's morning links included this most awesome piece of 19th century sci-fi ...embroidery. 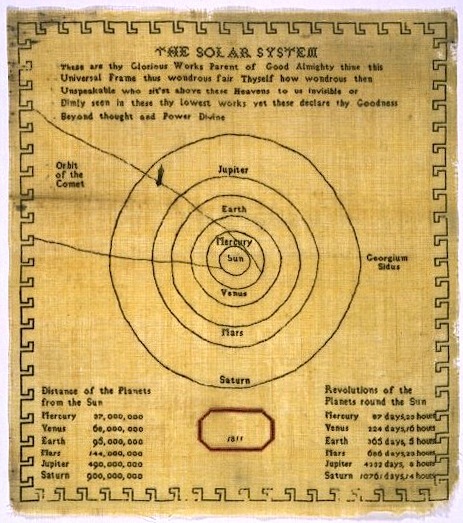 Yes, while other girls were cross-stitching horrible maxims about staying barefoot and pregnant (okay, no, not really), the luckier ones were embroidering models of the solar system. Hurray for girls doing science! And, speaking of girls doing science, AARRRRGGGGGGHHHH to the whole Jane Goodall plagiarism thing. As a respected scientist, this is WHOA OH NOES territory, as a woman in a male-dominated field, bad, bad news, and as a writer... realizing that she has a ghost writer?? Oh, dear. Oh, dear. Really -- I'm watching this whole thing with crazy intensity, seeing how it's going to turn out. It's La fiera del libro per ragazzi once again! Or, if you non parlano Italiano, that's the Children's Book Fair, held yearly in Bologna, Italy. Last year, Jules went, I think the year before that, Betsy Bird went and both had a fine, fine time. My agent goes every year, and I... pout. Someday, someday! The fab thing about the fair, other than the fact that it's where many American publishers gather to sell international rights to their author's works, is that this year Bologna is celebrating fifty years. We tend to be a little provincial, as Americans, and forget that our own children's literature history barely getting started, compared with the many countries in which our own tales find their roots abroad. Here's to international stories, international traditions, and seeing more of the world in American books for children. I hope my SAM has a lovely time, and even if he doesn't bring me a cool bookmark this time, I won't begrudge him too much. That embroidary made me awfully happy too! And John and Hank make my boys even happier...I'm glad to have them as co-parents. Love that embroidery! And yeah, I'm still reeling over the Jane Goodall scandal. Sigh. And um, I have been known to watch an episode or three of The Lizzie Bennet Diaires. @ Charlotte: It must be so weird to have someone else your kids listen to so closely! It's awesome. That embroidery is made of awesome. (Uh, and thread.) I took a quick look over the article at the Museum of Childhood blog and it was fascinating stuff! My agent's at (or WAS at) the Bologna bookfair, too. JEALOUS.